Now that the Philadelphia Eagles' offseason is (finally) underway, let's take a look at each position and figure out which players will be back in 2018, and which ones will be playing elsewhere. Here we'll look at outside linebacker. Earlier this morning we broke down in detail what it might cost to retain Bradham in free agency this offseason. The guess here is that he'll get a deal somewhere in the ballpark of $5-6 million per season, and that he'll stay with the Eagles, where he is valued by Jim Schwartz. 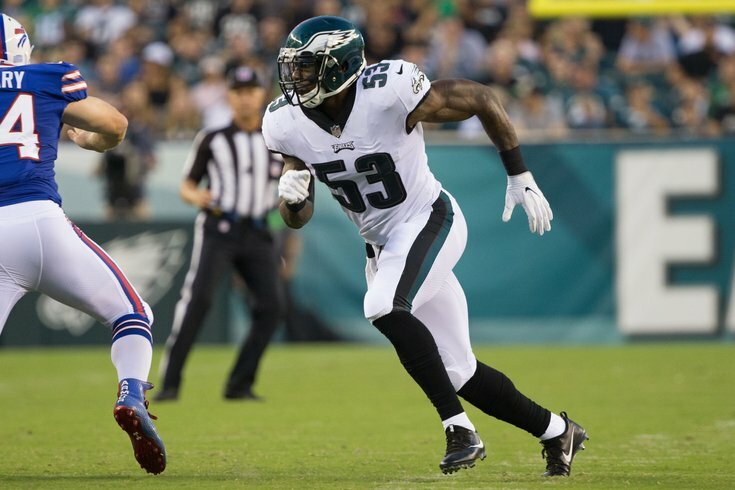 Nigel Bradham: Stay or Go? If Bradham leaves in free agency, expect the Eagles to retain Kendricks. However, if the team feels good about Jordan Hicks' recovery from a ruptured Achilles, and Bradham re-signs with the team, Kendricks is simply going to be too costly to keep around at $7.6 million as a third linebacker. #JimmyVerdict: We project that Bradham will indeed re-sign with the Eagles, and Kendricks will likely be on the trade block once again this offseason. After a quality season in 2017, Kendricks should attract better offers than what the Eagles received last offseason. Mychal Kendricks: Stay or Go? Grugier-Hill is one of the best special teams players on the roster, and he has some upside at linebacker because of his impressive athleticism. He'll be a near lock to make the roster in 2018. Kamu Grugier-Hill: Stay or Go? Gerry, like Grugier-Hill above, was a safety in college who converted to linebacker in the pros. Also like Grugier-Hill, Gerry wasn't much more than a special teams player in 2017. Gerry did not make the initial 53-man roster in 2017. He was cut, came back to the practice squad, and was later added to the active roster. He was active on game day from Week 7 through the Super Bowl. #JimmyVerdict: Gerry will have to earn a spot on the roster again, though I'd lean strongly toward him doing so in 2018. Nate Gerry: Stay or Go?